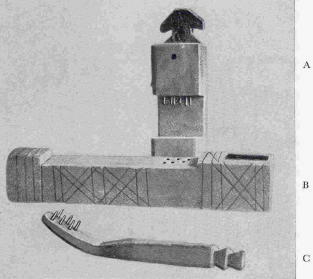 He said: the lock consists of two main sections of which section A, the lock case, is mounted on the inside of the door by means of strong pegs, while section B represents the bar or bolt which slides in the lock in a horizontal position. The key C passes through an oval shaped opening in the door that allows the hand and key to pass through. The key is then inserted in the locking bolt B and when lifted causes movable pegs in the lock case to raise. Corresponding fixed pegs on the key end are set so that a straight line is then secured between the lock case and top end of the shooting bolt, which can now be withdrawn. When locking the door the left end of the bolt shoots into a staple, and when withdrawing the key the pegs in the lock case drop by their own gravity into corresponding holes in the sliding bolt, which prevents its displacement. This type of lock allows a considerable variety of key permutations, as the pegs can take many positions on the flat end of the key, whilst the pegs themselves can also be varied. 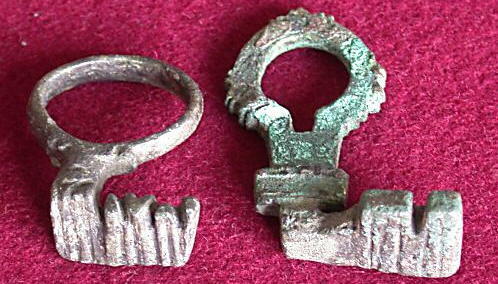 Roman finger rings. Note the upstanding end 'pegs' that move the tumblers. Being made largely of bronze many of these keys have survived until the present day; regrettably though most of the Roman locks constructed of iron, have been unable to withstand the passage of time. The Romans later used obstacles to 'ward off' a wrong key against gaining access to their locks. This created the first use of wards, a principle that was to remain the mainstay of guarding entry to lock mechanisms for around 1500 years. From the earliest simplest form, wards were developed over the centuries into complex patterns to obstruct access. 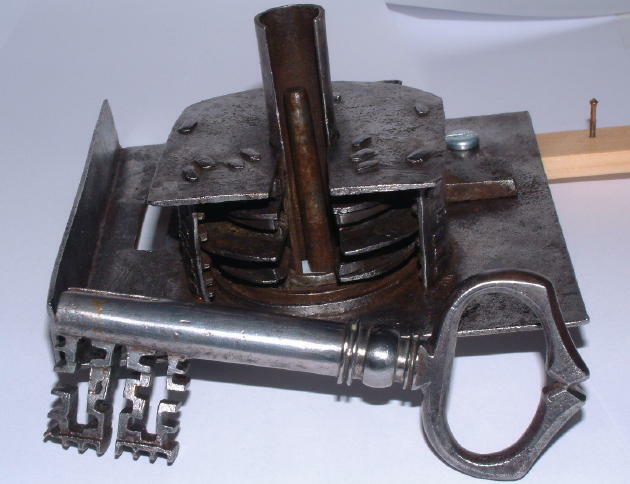 Here below is an elaborately made lock with a 'box' surrounding four sets of wards, through which the delicately made key bit has to pass in order to reach the lock mechanism. Centrally between them is a flat circular metal piece that forms another obstacle for the key to pass through. 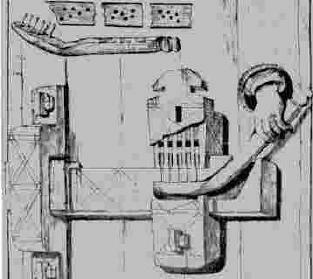 An additional ward fitted to English locks around the time of this lock (c.1700) was the hanging drill pin on which the key was inserted. The side of the pin was secured by a fixture to the lock case, rather than the normal method of the pin being fixed at its base. The fixing piece prevented the key from passing over the drill pin unless a corresponding slot was cut into the key; see the bit end of the shaft above. This late stage in latch development includes side plating and will next be ready to receive the cover plate. Early too came the making of wooden cased locks, called Stock locks (or Plate locks) which have their internal mechanism set in a block of wood. Several references to such locks are made in L.F. Salzman's Buildings in England down to 1540 (Oxford, 1952), e.g. In Corfe “4 stok-lokkes with keys for setting on doors” were bought in 1357. Also in 1376 locks called “platelok and stocklok” are recorded in Havering. 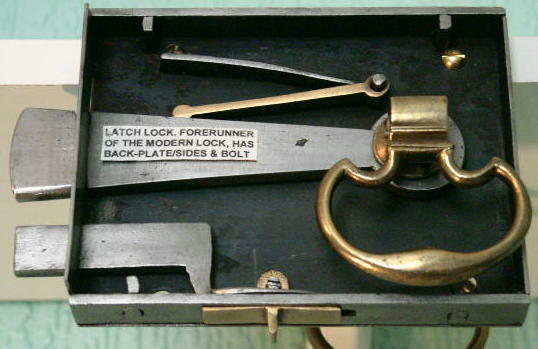 The earliest form of this lock would undoubtedly have had the metal working parts embedded in the case, like that below of c.1730. For some unexplained reason these have long been called 'Banbury' locks. The ward around the keyhole of this lock was invariably simple, though complex arrangements evolved. This lock shows that the key would have required an intricately cut bit to gain access to the bolt talon. Sometime before 1800 the mechanism was removed from the stock and fixed onto a metal plate, the first in the shape of a dovetail. The wooden case was hollowed out to accept the working parts, after which the plate with its mechanism was nailed onto it. Mass production of locks did not happen until well beyond the 1850s. 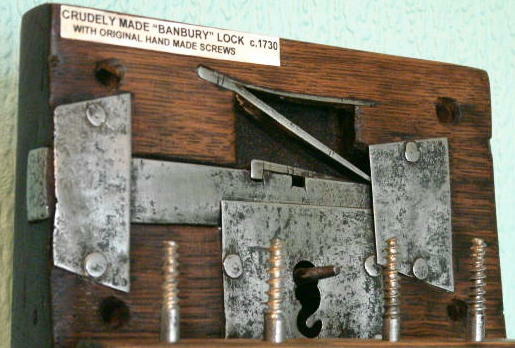 Chubb for example in the 1880s made all their locks by hand, and each was different. Style, workmanship and type of metal helps to identify the date of manufacture. 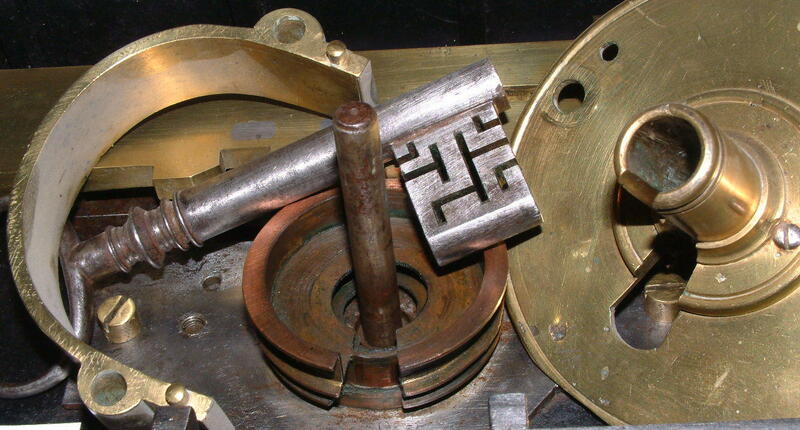 Handmade locks can be recognised from such things as changes effected by filing; and ends and corners that are not square. Also more individual pieces were made because of the difficulty to fabricate larger, complex parts without machines. Additionally some lockmakers inscribed their names and other identifying features such as trade marks, etc. 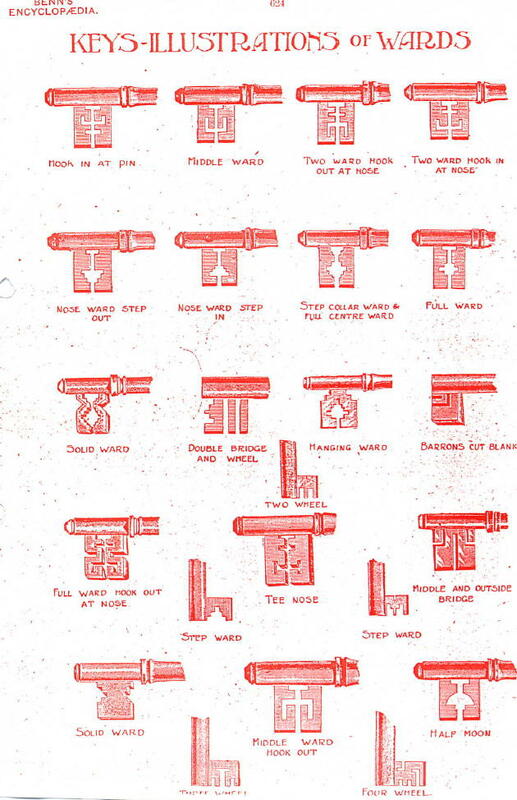 From 1774 the first patent for a lock was granted; and thereafter the patent records continue to provide another useful reference guide to lock dating. As the site grows please explore the categories to the left to find out more and explore patented locks.